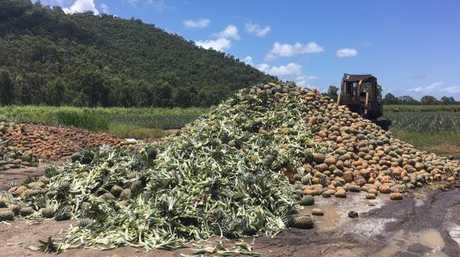 UP TO 100 tonnes of pineapples are rotting on the ground at Rollingstone amid a falling-out between North Queensland suppliers and processor Golden Circle. NQ Paradise Pines general manager Robert Richardson said the multinational company had refused to open its Brisbane cannery earlier than scheduled to support the summer glut of pineapples, leading to fresh fruit having to be dumped. "Golden circle believe they support the industry - most pineapple in Australia is grown in Queensland, but when you're producing 100,000 tonne plus and you're having 20,000 processed then you either have to lose growers and reduce the size of the industry or find new ways to sell the fruit," he said. 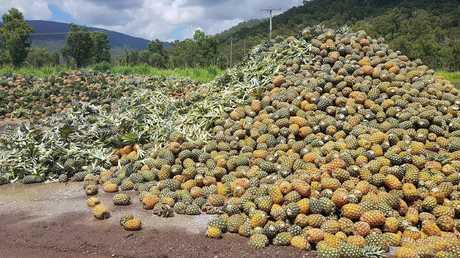 Mr Richardson questioned the food giant's plan to import fruit or canned fruit while 100 tonnes of pineapples rotted away in the paddock behind him. It is understood 100 tonnes of fruit is worth about $300,000, not all of which would go back to growers. "If we have an oversupply of fruit in December and they're scheduled to open in January … they will not open in January," he said. "[They will] let all that fruit either sit in the field or go to oversupplied fresh fruit markets and produce negative returns for growers." Mr Richardson took to social media after being tipped off by another grower that there would be problems. "I received information that from January Golden Circle would have a short supply of Australian canned product and be importing," he said. "I looked at that pile over there and I thought to myself 'there's not a shortage of fruit in the market'. "There's ample supply of pineapples, there are no reasons that any company should be importing pineapple or importing canned pineapples from other countries because it's all here." Mr Richardson said consumers should give major companies no reason to import overseas produce and instead support homegrown primary industries. "Food production is like the last bastion - if we lose food production and just start importing all of our food, then we'll be beholden to foreign companies," he said. "If you want Australian industries to survive, you have to buy Australian made. "If people go out and buy Australian-made product then that is more reason for Golden Circle to open that cannery and can the product, so it also falls back on to the consumer. "We'd prefer that canned product was Australian rather than imported so that we don't lose another industry to foreign companies." NQ Paradise Pines director Christopher Berra said he was frustrated that Golden Circle would not open the Brisbane cannery earlier. "This is the first time we've seen this amount of fruit being wasted," he said. "All the hard work we put into it, for it to end up like this is tragic. "It is a little bit embarrassing - I don't know what (Golden Circle's) circumstances are, but I know they could certainly get more fruit from the farmers at times when they have more fruit. It makes me upset - not just for us but for the other farmers - just to see the waste when it doesn't have to be like this. "I want people to become more aware of what's going on in the pineapple industry." Producer Rod Accorsini, of Crystal Creek, said the new owners of Golden Circle, US food giant Kraft Heinz, were trading on the proud Australian owned and grown reputation of the company, founded 70 years ago as a ­farmers' co-operative. "If they want to fly the 'Australian made' flag, they should live up to the reputation,'' he said. "But it is cheaper for them to import. "Both growers and consumers are copping the rough end of the pineapple." Tropical Pines sales director Joe Craggs said a successful season saw pineapple ready for picking earlier. "This year there is a very vibrant pineapple crop, some of the fruit from later in January has certainly come early," he said. "We've got a lot of extra fresh fruit right now - it's certainly a tougher marketplace." Golden Circle did not respond to questions. LNP frontbencher David Crisafulli, touring the North this week, said Golden Circle must come clean. "If they want to trade on an iconic Queensland brand they have to put Queensland fruit in those tins, and if they don't they have to have 'imported' emblazoned across the tin," he said.